You are handed a business contract and told, "Sign here." Don't do it! Before you sign, read the contract carefully, following these guidelines, to avoid problems later. Contracts are legal documents and if they are valid, they can be taken to court. That means you can be taken to court to uphold your end of the contract. Whether it is a real estate contract, business sale agreement, employment contract, or contract between you and a customer or vendor, you can use these guidelines. · Be clearly stated. As much as possible, both parties should agree on what is being said. · Express the agreement. After you have agreed verbally, the contract should state the agreement. · Be complete. A contract must answer any and all questions that either party might have and to anticipate any "what if" situations. Most lawsuits for contracts arise for contracts that are not clear and complete and that don't express the agreement as it was understood by the parties. All major terms must be defined completely. Much difficulty in contracts comes from incomplete or missing definitions. In one case, an unclear definition of “overhead" in the calculation of payment to an independent contractor caused a lawsuit. Overhead usually means expenses for administration and operations. But what's included in overhead can differ from business to business. Spell out exactly what is meant by terms like overhead. Make sure you are identified correctly. In most cases, it should be your business that's entering into the contract, not you personally. If your business has subsidiaries or is part of a holding company, make sure that this is noted. Also, check the identity of the other party. Is this who you think it is? Don’t worry about appearing dumb or difficult; its better to clarify now than find out later you and the other party were thinking of two different meanings. Contracts are almost always written because verbal understandings can become misunderstandings. And verbal assumptions can't be taken to court if the contract falls apart. This part is tricky; it is difficult to know what should be in a contract but isn’t. In employment contracts, for example, there should be a section describing how the employer can terminate the contract and what notice must be given. But sometimes there is no language about how an employee can terminate the contract and what notice must be given. For example, some contracts have no effective date or which do not completely identify the parties. Take a look at this Employment Contract Terms article for an example of the sections in a typical contract. If you don’t see something that should be in the contract, make sure it gets in. Boilerplate is so-called "standard" language that is in many business contracts. An example of boilerplate might be language having to do with indemnity (holding someone harmless for their actions). An indemnity clause attempts to keep one party from being sued. It also might prevent you from bringing a lawsuit against the other party. Another example of boilerplate is a mandatory arbitration clause. This clause attempts to mandate that any dispute is to be settled by arbitration instead of going to court. What happens if one party doesn't meet the obligations of the contract? This is called "breach of contract" and the answer to the question may be in boilerplate. Read carefully. Read those long boilerplate sections, even if your eyes cross and you start to nod off. Ask that the section be simplified or that it be shortened. Or ask that it be changed or taken out if you don't agree with it. Don’t hesitate to make changes that clarify or which are to your advantage. Remember that in a contract, everything is negotiable, even “standard” language. If you are reading a contract prepared by the other party, don’t rely on yourself or other non-attorneys to read the contract and find all the problems. Take it to an attorney who knows the law in your state. Don’t let the attorney re-write it (they love to do that and charge you for it! ), Just ask for comments on what might need to be changed. Then decide if you want the changes, and take the list of changes back to the table and negotiate. 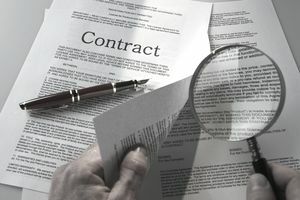 Following these guidelines to reading contracts may not prevent you from making a mistake and signing a contract that will cause you problems, but it can eliminate some of the most obvious problems and provide clarification, which is always a good thing.